WKU’s ROTC program recognized the service of all veterans and their families Friday and honored two of its own American heroes – 1LT Eric D. Yates and Lt. Col. Ken Hightower. Yates, a 2008 WKU Army ROTC graduate from Rineyville, was killed Sept. 18, 2010, after an IED exploded while he was on a foot patrol in Afghanistan. In addition to the Hall of Fame induction, Yates will be featured on a new panel at the Guthrie Tower. 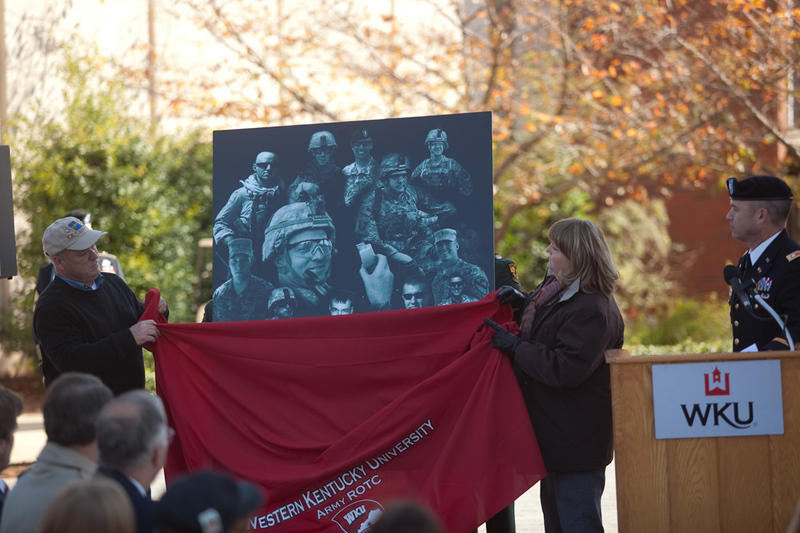 A replica of the etching featuring Yates and several of his friends was unveiled Friday morning. Yates, the son of Kathy and David Yates, was a fire support officer for Company B, 1st Battalion, 502nd Infantry Regiment, 2nd Brigade Combat Team, 101st Airborne Division from Fort Campbell. Caldwell thanked members of Yates’ unit for attending Friday’s ceremonies “to recognize and honor a fallen soldier and a fallen leader from their ranks.” About 85 soldiers from Fort Campbell attended the day’s events, which began at 6:30 a.m. with a 5K run. Capt. Tyler Reed, Yates’ friend and his roommate for two years, spoke on behalf of the Yates family at the induction ceremony and shared memories of his friend. “Underneath that uniform, he was quite a guy,” Reed said. “He enjoyed history. He enjoyed studying stuff. He enjoyed studying obscure stuff,” Reed said. Yates was devoted to duty and was always prepared to do his job, he said. “He’s in a better place. He did his duty and went out doing his duty,” Reed said. Retired Col. Greg Lowe, president of the ROTC program’s alumni foundation, said Yates’ parents taught him responsibility, hard work and faith in God and country. 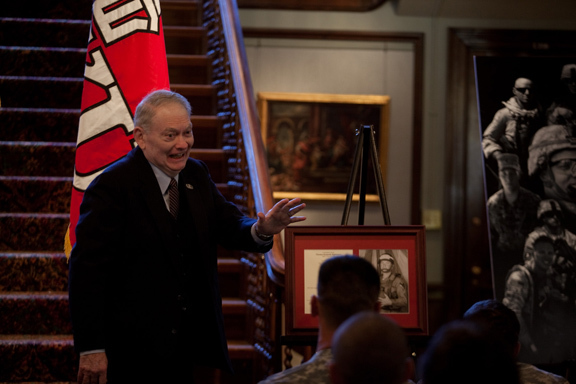 Yates came to WKU in 2003 to pursue a career as a history teacher and didn’t join the ROTC program until his junior year, but he was a natural leader – smart, confident, quiet, determined and made things happen, Lowe said. “David and Kathy molded him into the man he was,” Lowe said. The panel at the Guthrie Tower, along with the 1LT Eric Yates Memorial Scholarship, will serve as “a living and loving memorial to Eric,” he said. Yates received the Bronze Star Medal, Purple Heart, National Defense Service Medal, Global War on Terrorism Medal, Afghanistan Campaign Medal, Army Service Ribbon, Overseas Service Ribbon, NATO Medal, Combat Action Badge and Overseas Service Bar. His name also was among the more than 6,000 read during the Remembrance Day National Roll Call at Mass Media and Technology Hall. 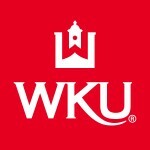 Thomas Kenneth Hightower arrived at WKU in 1956 from his native Todd County and majored in biology and chemistry. He joined the ROTC program and became battalion commander before graduating in 1960. 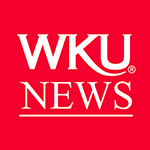 Lowe said Hightower’s experience in WKU’s ROTC program was a preview of his leadership abilities. He then recounted the story of Hightower’s heroic efforts in battle on Valentine’s Day 1967 in Vietnam that earned him the Distinguished Service Cross, an award for valor that ranks second only to the Medal of Honor. Hightower’s son, Chip, said the ROTC Hall of Fame induction was a special day for his father and the entire family. “He never sought out any recognition or dwelt in the past so today is very, very special,” Chip Hightower said. Between 1963 and 1977, Hightower served in Germany, Panama, Vietnam, South Korea and at the Pentagon. From 1978 to 1980, he served in the Department of Army Material Development and Readiness Command. In addition to the Distinguished Service Cross, his other awards include Bronze Star (Oak Leaf Cluster), Meritorious Service Medal, Air Medal, Army Commendation Medal (two Oak Leaf Clusters), Army Occupation Medal, Republic of Vietnam Service Medal, Republic of Vietnam Campaign Medal, Republic of Vietnam Staff Service Medal, Combat Infantry Badge, Parachutist Badge, General Staff Identification Badge, National Defense Service Medal, Vietnam Cross of Gallantry (Palm Unit Citation) and Meritorious Service Unit Citation. 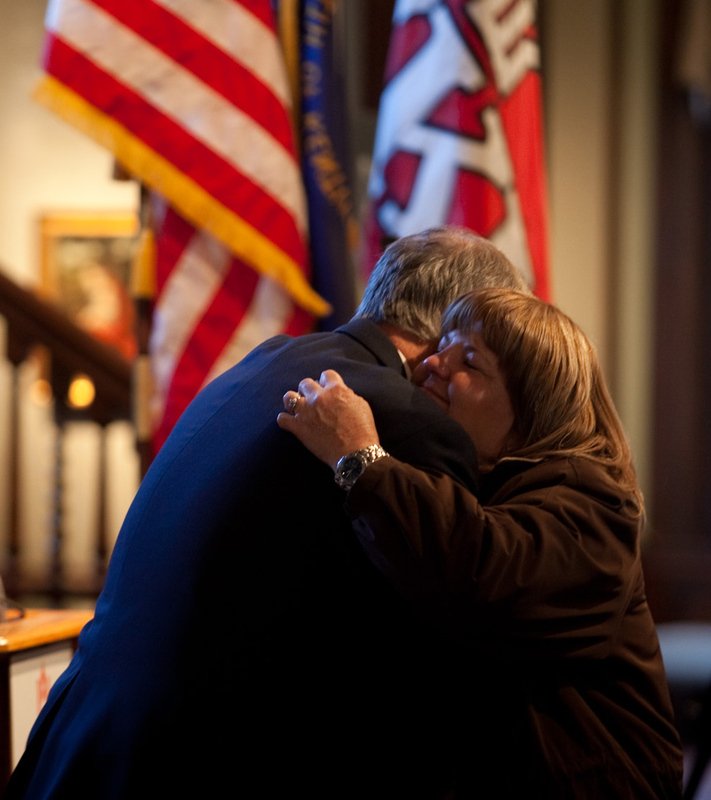 He and his wife, Peggy, live in Bowling Green and have four children and 11 grandchildren. Contact: Lorie Estes, (270) 745-4293.